I need some of my storage space back. I had set up to make this kayak some years ago and its been hanging around getting in my way ever since. Now is the time to put up or shut up, meaning that I either build it or take it down and forget about it. So, after rubbing out the filler on the Tremblay Tuesday afternoon, I pulled the mold into the shop and started the kayak. This is how it looks at the end of Wednesday. I can't afford a lot of time for this project, so I am taking it in stages. I will get the hull planked and fiberglassed, then take it off of the mold, put it away till the next stage. 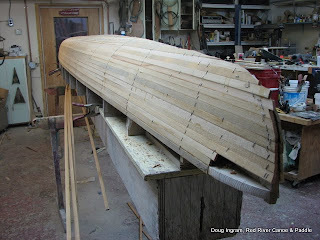 Then I will take the mold apart and store some canoes for winter! This is a kayak that I drew up the plans for about 7 years ago. It is based upon a single Baidarka, or Aleutian kayak. 17'6" long, 23" beam (if I remember correctly). I am building this one strip plank. I had had thoughts about pulling a composite mold off of this, that is why I had set up to build this way. We'll see how it is received and make decisions from there. The gaps that you see will be filled in with solid wood and then shaped. 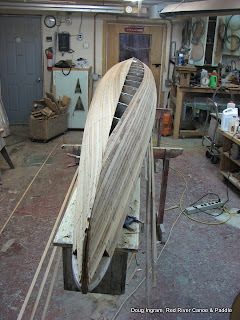 The shapes at the extreme bow and stern are to complex for the strips to fill. Posted by Doug Ingram at 9:42 a.m.